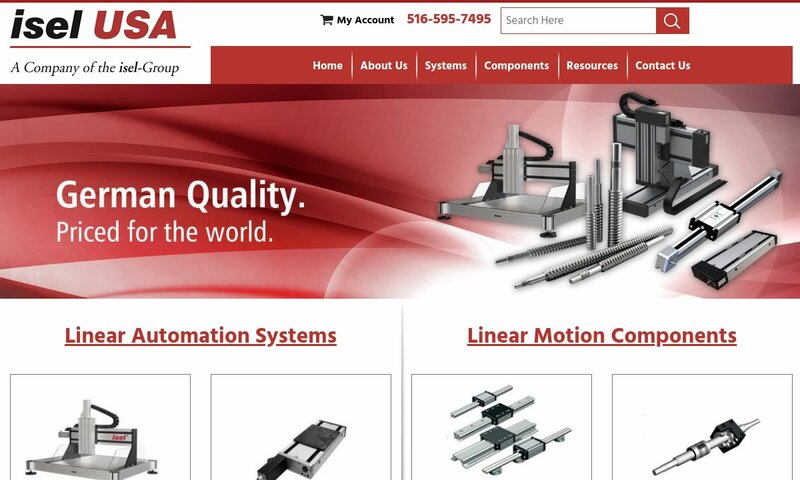 A reliable source for Linear Slides information and a resource for accessing leading Linear Slides and suppliers. 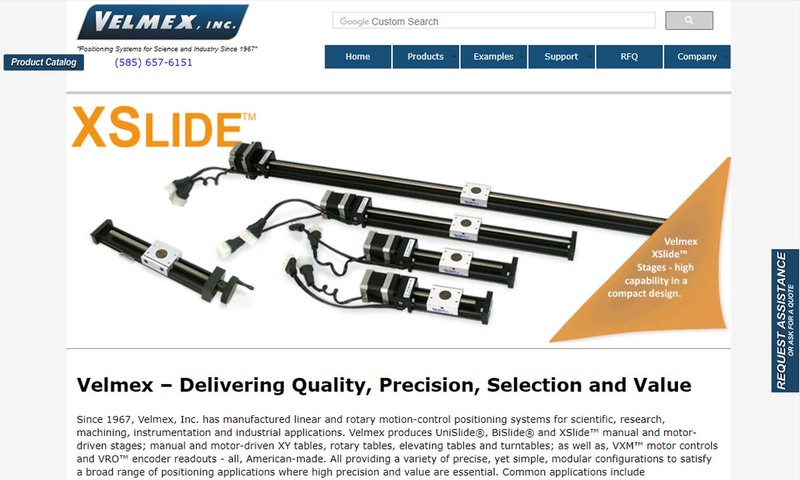 Linear slides are precision-controlled devices that provide pushing, pulling or positioning action along linear planes. They carry out linear motion, which is why they are named linear slides. Linear slides, also known as linear motion bearings, are manufactured to provide free motion and machine operation control. They provide accurate mechanism guidance and support and smooth, precise moment. The precision controlled, automated nature of linear slides provides an ideal solution to many operating needs for both large and small applications. Examples include: clean room operating, robotic welding, robotic assembly, instrumentation, precision eyeglass assembly, automatic packaging, CNC-operated machining and more. Linear Slides Linear slides are precision-controlled devices that provide pushing, pulling or positioning action along linear planes. They carry out linear motion, which is why they are named linear slides. Del-Tron is a linear slide manufacturer/distributor of ball bearing slides, crossed roller tables, roller slides, multi-axis positioning stages, xy tables, motor-ready lead screw stages & crossed roller rail sets. 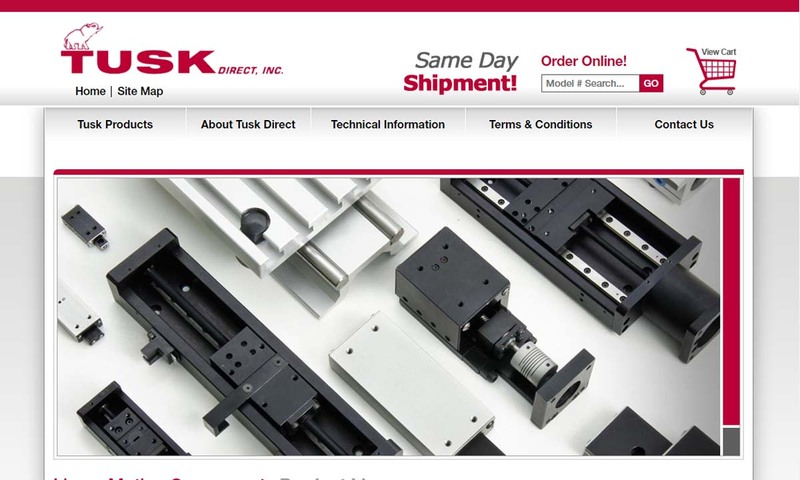 When describing Tusk Direct, a linear slide distributor, products such as linear motion components, roller tables, ball & crossed roller slides, dovetail slides, bushings, multi-axis positioners & motor ready lead screw actuators, come to mind. Discover the Bishop-Wisecarver difference. Offering 60 years of design experience with the widest range of guide wheel based solutions in the world. Established in 1967, Velmex makes manual & motor driven dovetail slides, open frame tables, twin rail slides, rotary and XY stages. Choose hand, lead screw or belt drive. We are a leading manufacturer and distributor of quality linear and rotary motion products to customers around the world. Since 1972, we have provided precision automation systems that are currently being used in medical, industrial, assembly, inspection, pick-and-place, scientific, electronic, drilling and milling applications. 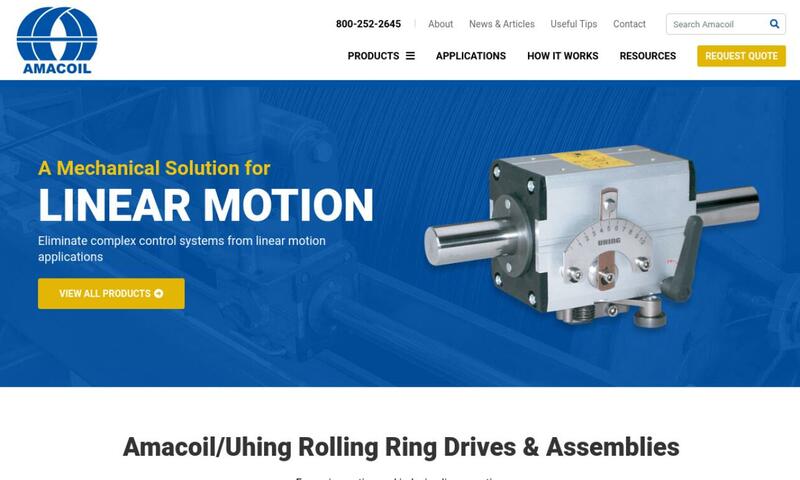 Amacoil is the only authorized North American distributor of Uhing rolling ring linear drive assemblies and timing belt actuators. We offer Uhing products individually or in custom engineered assemblies, and we provide full service on all Uhing linear drives. Humans have been using linear slides for a surprisingly long time, since at least 40 B.C. We know this because archaeologists have dated the wreckage of a Roman ship containing wooden rolling bearings to this date. It would not be shocking, though, if they have been in use even longer than that. We have evidence of this, based on the fact that Egyptian hieroglyphs and tomb drawings seem to depict linear slide use. In this case, the drawings suggest they used slides made from tree trunks under sleds, bearings used with hand drills and liquid lubricated, plain bearing-like runners. Closer to the modern age, during the Renaissance, Leonardo da Vinci sketched ball bearings as part of a helicopter design. Not long after, Italian engineer Agostino Ramelli published the earliest known sketches of roller and thrust bearings. Galileo improved on Ramelli’s sketches in the 1600s, by proposing caging rollers or balls be placed inside a friction-reducing enclosure. Though Galileo proposed these changes, they were not enacted until the 1700s, when John Harrison used caged roller slides with his H3 marine timekeeper. 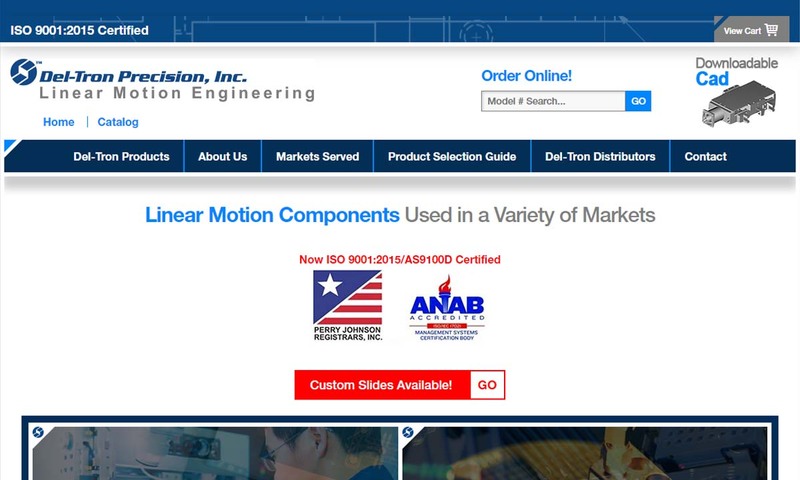 Precision Linear Slide Products – Del-Tron Precision, Inc.
Next, during the Industrial Revolution, Philip Vaughan patented the first ball bearing design that featured a ball running along a groove in an axle assembly (1794). In 1869 came the invention of the radial style ball slide, followed by the tapered roller bearing in 1898. Also, in 1883, engineers came up with a more effective method for grinding and milling uniform bearing balls. During the 1800s, these improvements were used to: produce more accurate timepieces and watches, run water in mills and help wheel and axle assemblies run more smoothly. The 20th century started off with the invention of the self-aligning linear ball bearing by Sven Wingquist (1907). A few decades later, in 1934, Erich Franke developed the wire race bearing. 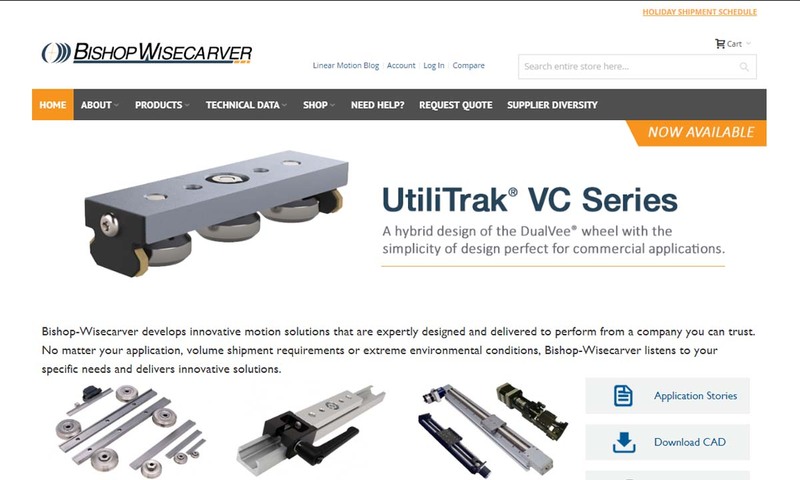 About 30 years later, Bud Wisecarver invented v-groove bearing guide wheels, then patented them in 1972. In the early 1980s, Robert Schroeder, an employee of Pacific Bearings, invented bi-material plain bearings, a type of bearing slide that consists of a meal shell and a layer of Teflon-based material that is connected by a thin layer of adhesive. Today, in the 21st century, the slide guide industry has largely been shaped by robotic automation and high-tech applications, such as dental drilling, optical alignment systems and the Mars Rover. Linear slide production is dependent on a combination of processes including: extrusion, shape rolling, shape drawing and forging. Using these processes, manufacturers put together components including: a stationary base, a carriage and a linear rail of bearings. The rails may have a flat surface or they may be round and polished. Once they’ve fabricated the parts, manufacturers then attach the carriage to the base along the linear rail, so that it can effectively slide along the bearings from one end of the base to the other. If the slide is to include a motor, they then attach that as well. Regardless of their configuration, linear systems generally count on three metals for their composition: cast iron, aluminum and stainless steel. Each of these lend strength or protection of some sort to the slide they serve. The most common material used to fabricate linear systems is cast iron, because it is incredibly strong and durable. As it is fairly resistant to wear and tear, cast iron is especially desirable for heavy-load applications, which are particularly susceptible to stress. Aluminum is popular because it maintains its structure and shape under stress. Finally, stainless steel is the go-to metal for linear slide systems that function in environments where they will be exposed to corrosion and humidity. Leading up to linear slide construction, manufacturers think about factors of the application, including: application environment, projected frequency of slide use, projected speed of operation, type of products to be carried and load weight. Based on these factors, they make choices about: material, configuration, and design specifics like whether or not to include a bearing housing (covers, shields, slide blocks, etc.) and whether the slide will use motor power or inertia. In addition, manufacturers may choose to customize your linear slide. They may do in a number of ways, most often by: rail width (measured in mm), base length (measured in mm), shaft style, flange type, friction level, standard requirement adherence, load capacity, resistive element and saddle length (measured in mm). Typically, linear slides are simply composed. They have a stationary rail base of bearings upon which a carriage, moving platform, or some other component is attached. This movement offers an exact, reliable range of motion that requires very little energy output and is subject to very little friction. They may also feature shields or covers, which manufacturers include as a protective barrier between sensitive bearings systems and outside contaminants, like dust and debris. Often, linear slides function is motor less and work with inertia. (The more inertia a slide has, the more torque, the force that produces rotation, is needed to move it.) Other times, they use linear motor power. In the case of the latter, they feature drive mechanism, which is powered by AC or DC power and sometimes fuel. Note: though motors add more power and speed, since linear slides are designed for high precision movement control, power is not super important. Linear slides can widely be divided into groups of motor less slides and motorized slides. Even when moving thousands of pounds of weight, motor less slides require a low amount of torque and can get the job done with relative ease. Motor less slides include: ball bearing slides, drawer slides, roller slides and telescopic slides. Motorized slides can be moved at precise, programmed speeds. This offers greater motion control. Motorized slides include: XY tables, roller tables, machine slides, most lead screws and some dovetail slides. Ball bearing slides, which are also called “ball slides,” are self-lubricating, a quality that increases their reliability and ensures they perform with a smooth, linear motion. Ball slides, the most commonly used linear slide, typically have four ground shafts that surround the balls at four different points. Drawer slides, as their name suggests, are a type of slide that help drawers open more easily. Roller slides also stay true to their name; they use perpendicular rollers to achieve higher load capacities than ball slides. Roller slides tend to absorb less stress from weight as they offer a line of contact, rather than the point contact of a ball bearing. The last motor less linear slide mentioned here is the telescopic slide. Telescopic slides have concentric parts that slide inside of each other and, as a result, they are capable of compaction and expansion. XY tables are motorized, with bearing-based linear motions that are usually powered by a linear motor. Machine slides provide precision movement for CNC machining operations. Placed in front of an attached carriage, these linear actuators brush or wipe clean the railings in front of the carriage. They do this to remove contaminants and to help the carriage move more smoothly. Lead screws are linear bearings that bear many similarities to the ball screw. Lead screws differ mainly in the fact that they do not use ball bearings to eliminate friction between the nut and screw. Rather, they do so with deep helical threads and a mating nut. Lead screws also self-locking and do not require a braking system. Most often, they’re used with vertical applications. Finally, dovetail slides, which consist of a fixed base and either a saddle or flaring tendon, are used with high load applications that require damping and/or long travel distances. Linear slides offer countless advantages to their users and offer both initial monetary savings and long-term time, energy and monetary savings. First, they use very little energy. This is especially true if you choose a motor less variety. Second, they create very little friction, which makes them quieter, smoother and longer lasting. While creating little friction, they still manage to move thousands of pounds if needed. Likewise, they require minimal torque to move massive loads. 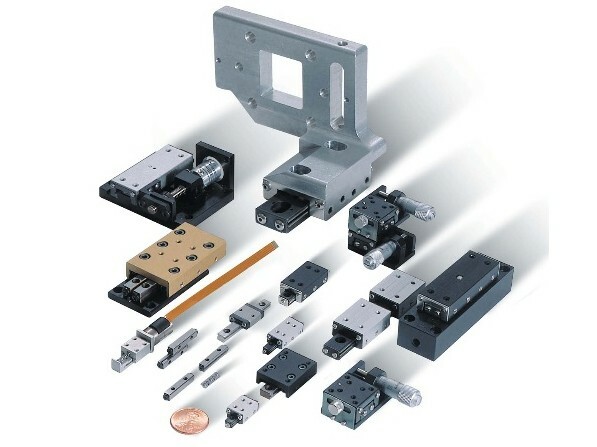 Finally, with few moving parts, linear slides require less maintenance than most systems. There are many accessories available to you and your linear guideway system. Which ones you end up with depends entirely on your application. Some common accessories include: wipers, seals, lubricants, slide guide mounting hole caps, clamps, block stopper plates, roller tables, height adjusting blocks, mounts, linear locks and stopper bolts. Linear systems face a variety of challenges, depending on their application. For example, extended exposure to moisture causes corrosion, which will, left unchecked, surely result in total system failure. Though they are low-maintenance machines, some linear system components degrade faster than others. To keep your machine healthy and running efficiently, you will need to periodically replace your bearings, as they are the most susceptible to wear and tear. Also make sure to attend to the conditions of the building in which your linear systems are housed. Linear bearings should be protected from debris, dust and other contaminants with a barrier, such as a cover or shield, that is attached to the system but does not interfere with mechanism operations. An example of such a shield is the machine way, which, when placed in front a machine slide’s attached carriage, wipes or brushes its railing before the carriage passes over it. Note that shields like this, while removing dirt particles, may increase the friction level of some slides, such as the dovetail slide. If this is the case, users will need to apply extra lubrication to their slide. Treat them well, and your linear slides will prove to be excellent investments. There are a lot of linear slide manufacturers and suppliers out there. How do you discern between the good, the bad and the ugly? On top of that, when you’ve found the good, how do you know which one is right for you? Well, to help you with that first part, we’ve compiled a comprehensive list of leading manufacturers we know to be trustworthy and reliable. If you stick to this list, which you will find fleshed out with profiles in the middle of this page, you can be sure you’ll find a high-quality manufacturer. With that out of the way, how do you figure out which manufacturer is right for you? We recommend, before looking at the profiles above, that you put together a list of your specifications. Don’t forget to include standard requirements (industry, application and/or location related), your preferred timeline, your budget, your delivery needs, etc.  Once you have the list put together, you can start looking at manufacturers. Browse their profiles and service and product descriptions, and pick out three or four that look like they may be able to best fulfill your requirements. Then reach out to each company in that group individually. Go over your specifications with each, taking notes of what standard and custom services they offer. Once you’ve done that, compare and contrast your conversations, and pick out the company in which you feel most confident. Good luck!